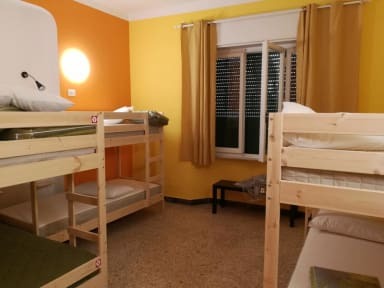 Pisa Train Station Hostel, a brand new hostel it is located 100 meters from the central train station. We will welcome you cordially to our rooms; all Wi-Fi connected with free and fast internet, lockers with locks, hair dryers and universal battery chargers for your smartphone, tablet and much more! Furthermore, there is an equipped kitchen to cook your favourite dishes freely and a common area with TV, play station, board games and books to help relax and meet new people! Our love for Pisa and travelling will help you experience your stay in Pisa at its best. We have created guides and maps of the city that are free of cost to help you discover the hidden beauties of our city and its surrounding areas. We do not define a hostel as a location to sleep affordably, but a place where we can learn about different cultures and lifestyles, a continuous exchange of experiences. To help facilitate all of this, we regularly organize tournaments, group games, excursions and beginner level Italian classes free for whom would be interested in learning helpful phrases. We are offer excellent and central location. We are located 100 meters from the Pisa Central Station, 500 meters from the main boulevard in the center, 1.5 km by foot or 10 minutes by bus to the Duomo and the Tower, 10 minutes by bus or 2.6 km by foot from the Pisa Airport! Close to our Hostel, you will find restaurants (Italian and international), bars, grocery stores, pizza places, kebabs and stores to meet all your needs! We offer comfortable private and shared rooms. Fast WiFi connection free of cost in all the rooms and a computer for internet access and printing of documents. For increased safety, every room has lockers with personal keys. You have a kitchen available with many accessories, with kettles, stove, toaster, etc. A vending machine is available 24 hours with cold drinks and snacks! In our common area you will find everything, you need to relax and meet people! (TV, PlayStation, books and many board games that are waiting for you. When you arrive, you will be leaded blankets and sheets that are clear and free of charge. Cannot keep them, but you can use them during your stay! We offer maps and guides of the city, as well as an app guide for your smartphone, created by yours truly. 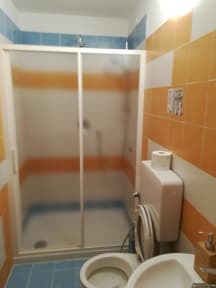 A nice hot shower is ideal to recoup from an excursion… therefore for no additional cost there are hot showers and hair dryers available for our guests. If you need clean towels, mono dose body wash & shampoo? For a small fee, you can access these items.